With that, dear reader, welcome to Shadows, the hub of my small cluster of websites. Where once it was the source of anything and everything I had to display, now it acts more as gatekeeper, as passageway to the new web of pages I have woven. Nevertheless, this page does contain much, even now. To peruse its offerings, look to your right and follow the links. To see what has changed recently, one has but to look below, where I will include the most recent update pertaining to this site. To see all updates, please visit Oxymora!. If you enjoy the site, sign the Guestbook! November 11, 2006 | The real grand opening begins. All new sites operational. 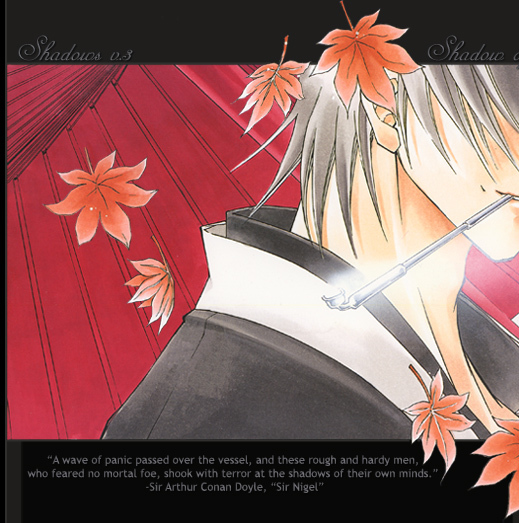 September 10, 2006 | A bit over two years since the last revamping of Shadows now sees its greatest change yet. Scattered, are the sections amonst various subdomains. New sections have been added. A brand-new layout has been created for this page, the nexus of it all. I have also at long last created a replacement for the old Okcounter hit counter, which vanished when they underwent a change of management. With the aid of Php Magix, I've given shape to a little marvel, a MySQL- and PHP-based hit counter. Delightful it is!